The Winter Steam Spectacular at the beginning of March was a resounding success as the photographs and videos we have received testify. 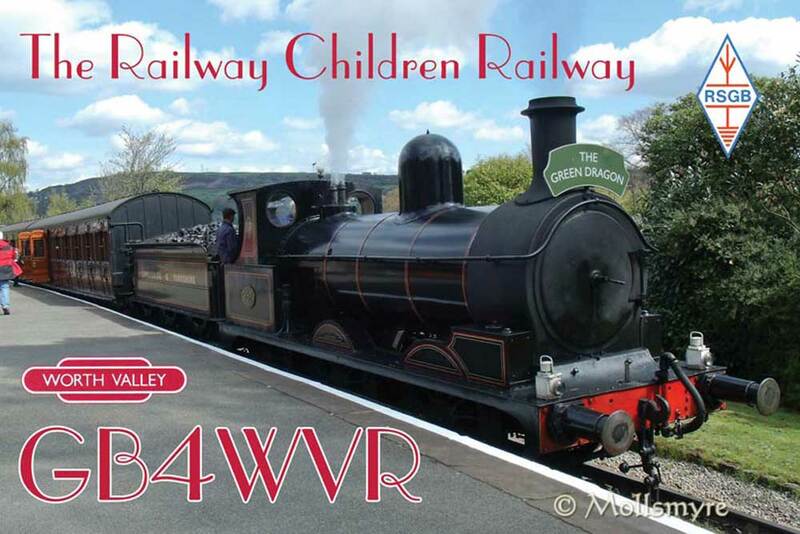 For one family trio the event is remembered for a different reason, the first time that the Worth Valley Railway Amateur Radio Station (call signs when operating from the Railway GB4WVR and GB5WVR) which normally operates from the VCT at Ingrow, broadcast from Oakworth. You didn’t know there was a Worth Valley Railway Amateur Radio Station? Then you are not alone. It is quite likely that few of the Society’s non-working members or the general public are aware of the Proctor family and their keen interest in amateur radio. 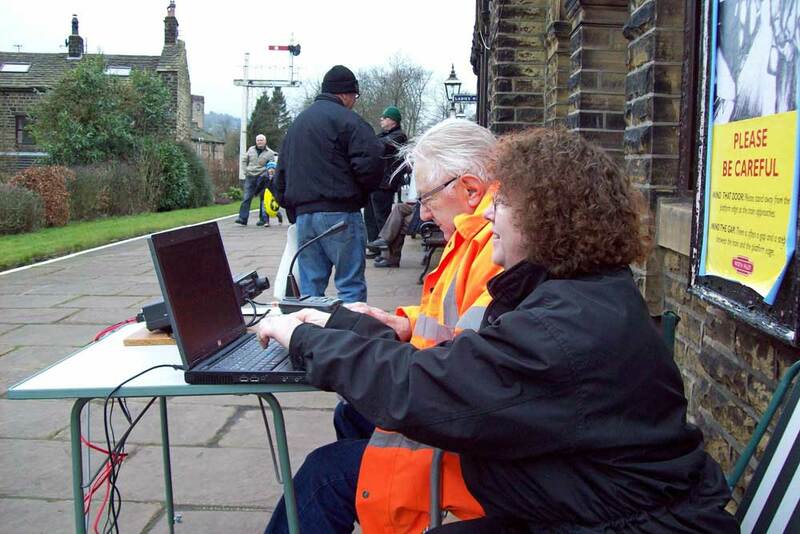 But as the photographs testify, long standing member Jack Proctor, not so long standing member, son Mark who has been with the Society for a mere 42 years, and Mark’s wife, Pam, broadcast from Oakworth platform during the March event. Living in Leyland, Lancashire, Jack Proctor was a very active member of the Railway in its early years along with a close friend from Leyland and recalls he and his friend being a member of the gang involved in digging out Oxenhope track by the station, the first time it was ever dug out in the preservation era. He also well remembers his close friend, the late Jack Rowell, bringing out the tea in a galvanised watering can, “Who remembers that now I wonder?” he muses. Jack later qualified as guard, a duty he undertook for many years until an old RAF injury to his spine brought about failing health and Jack’s guards duties had to take a back seat. He was also involved, with the help of Chris Bates, a few railway friends and fellow guards, in running excursion trains from Lancashire over the Settle & Carlisle and then on to the Worth Valley Railway metals, with profits going to the Railway. 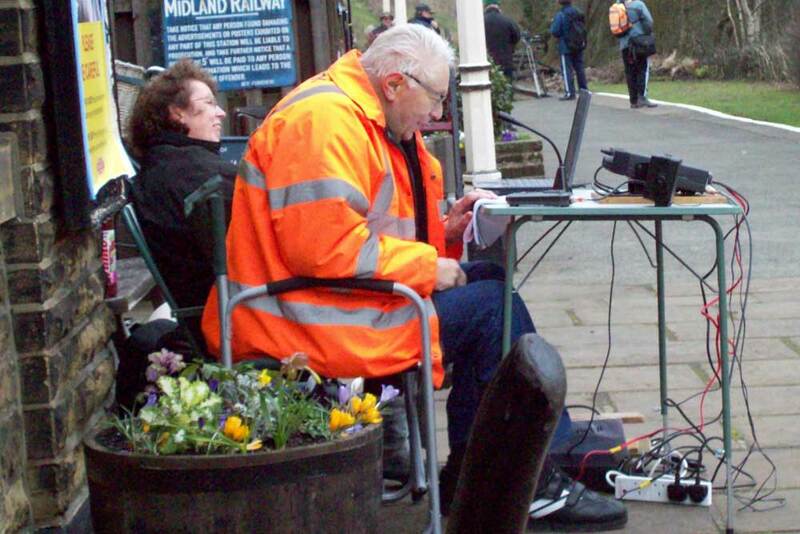 With his guard duties now behind him, nevertheless, as a fully licenced amateur radio operator, he can still use the radio to publicise the railway far and wide and has been known to meet up with fellow radio hams all over Europe who have visited the railway. “The feed back is great, more so when the train crews co-operate with us and give a few good whistles which goes down well.” When operating they are not allowed to directly publicise the railway by giving out train times etc. But they try to keep the microphone open while the trains are in sight, the sounds of a working railway going down very well with other radio hams who listen to their transmissions with every sound heard on the platform clearly audible to whoever is listening. The Worth Valley sounds have been heard in Poland and as far as Ukraine. The sounds of the Worth valley reaching the parts other railways cannot reach! How far the transmissions reach depends on the suns radiation on the F layers and this changes during the day. Jack describes it as rather like fishing, you never know where the next ham station will pop up from. Often they have pile ups which is when literally hundreds of hams are calling them, but they never know how many but quite often get cards from them. The trio have postcards on which are printed all the details of the railway and these are sent out to everyone contacted. Referred to as QSL cards, on the front is the photograph featured at the top of this feature and on the reverse are the Railway’s details. It is up to Pam Proctor to send these out and without whose help, Jack admits, he and Mark would not be able to keep putting the station on air. With Facebook, Twitter, the KWVR website and this News site broadcasting the Railway’s story in the modern media world, it is fantastic that a media in use today that was around in the days of steam is still playing its part on the capable airwaves of Jack, Mark and Pam broadcasting the KWVR message to a world beyond these shores. And if all that was not enough, Jack is a dab hand at washing-up and can be found doing this duty on the lunchtime Pullman dining trains and for the Civil gang during Civil Week.